This Cold Spinach Feta Dip is perfect for parties, potlucks, and neighborhood barbecues! This easy appetizer is packed with flavor and goes wonderfully with a platter of veggies, crackers, pita chips, or pretzels. You can make this ahead of time and pop it in the fridge until it is time for the party so it is low stress. Also, since it is a no bake cold dip recipe, it really only takes about 15 minutes from grabbing the ingredients from the fridge to popping it back in to chill. So delicious. So easy! I get recipe inspiration in a lot of places. This one came from a long time ago… I am talking pre-kids kinda long time ago. I was headed on a girls trip with some sweet friends from church and I was the self appointed head of snacks. I stopped at one of my favorite places, Central Market, and scanned the aisles. I ended up with a cart full of deliciousness, but the one that won our hearts that weekend was the cold spinach feta dip! I have no idea if they still make this stuff since we long since moved away and I sadly don’t get to roam the aisles (or hoard their fresh mozzarella) anymore, but I do still dream about this dip! 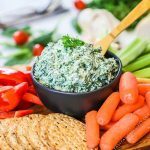 The Cold Spinach Feta dip was simple flavors that just came together perfectly for a delicious dip full of fresh flavors. I have done my best to serve the memory justice with this little recreation. With so many years between me and the Central Market dip, I have no idea how close this actually is, but I do know that it is also really crazy delicious and we can make this disappear pretty quickly at any get together around here! If you need more delicious dips in your life try out my Spicy Pimento Cheese, or see all of my Dip Recipes here! This recipe is, of course, best served cold. I like to keep it in the refrigerator right up until it is time to set it out. The dip can be served in a bowl, or you can shape it more like a cheese ball once it is chilled. I usually just keep it simple and put it in a bowl though! Veggies- Serve it on a platter with lots of veggies. Fresh crunchy veggies that can hold up while dipping work best. I suggest carrots, celery, cucumber slices, pepper slices, etc. Pretzels- Make sure and get ones that will work well for dipping and don’t break easily. You can put it with a few of these or all of them. I love to arrange it on a big board or platter with everything arranged around it for a great presentation. If you have another idea for a great thing to pair it with, I would love for you to leave me a comment so I can try it out! This Cold Spinach Feta Dip is super simple to throw together. I am going to leave a few notes for you here just to answer any questions that may come up while making this recipe. 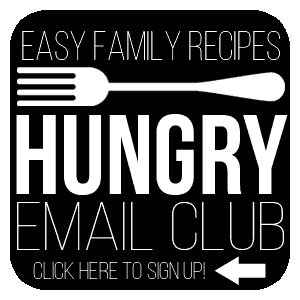 You can find a full, printable recipe card at the bottom of this post. 8 oz cream cheese, softened- I use original Philadelphia Cream Cheese. You can also use light or neufchatel cheese if you prefer. Make sure that you soften it so that the flavors combine well, or if you don’t have time, I recommend using an electric mixer instead of hand mixing. 8 oz frozen chopped spinach- I highly recommend using chopped so that the spinach isn’t too stringy and is more “bite sized” in the dip. 1/2 cup feta cheese, crumbled- Again, I just use the regular feta cheese. You could substitute low fat, but I really prefer the regular stuff here for the rich flavor it adds. Since there is only 1/2 cup it gives you a ton of flavor with just a small amount. 1/8 tsp nutmeg- This is the “secret ingredient.” This tiny bit of nutmeg really brings the flavors together in the most wonderful way! Don’t leave it out! 1/8 tsp cayenne pepper (optional)- This will enhance the flavor and add just the tiniest kick. It really doesn’t make it spicy, however if you are sensitive to it, feel free to leave it out. Q: Do I have to chill the Spinach Feta Dip? A: While it is pretty good once you mix it up, the flavor will intensify once it is chilled so I do recommend it! It will also allow it to firm up some too. Q: Can I make this into a cheese ball? A: Yes! After you chill it you should be able to shape it as desired. Q: Can I make this dip thinner? A: You can mix in 2-4 tablespoons of milk in step 2 if you prefer to have a less firm dip. Q: Is this dip gluten free? A: Yes! This dip is naturally gluten free! Make sure to pay attention to what you serve it with as not all crackers or pretzels will be gluten free. Q: Is this dip low carb? A: Yes! 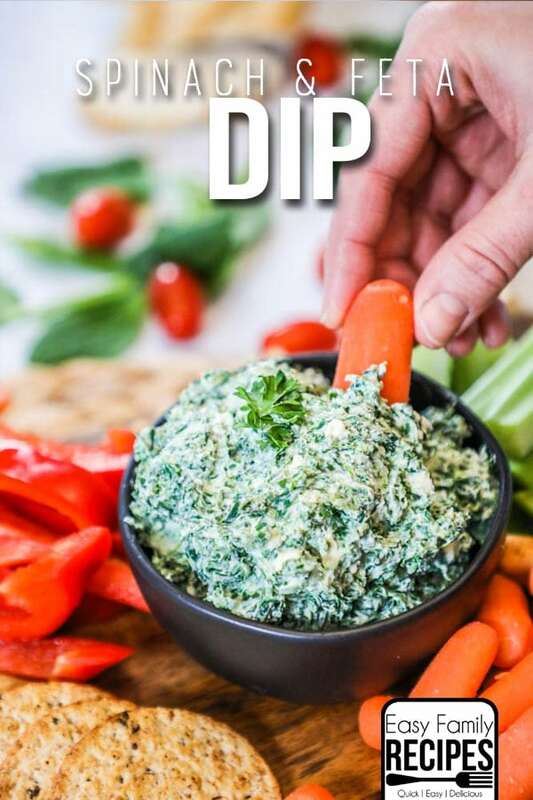 This dip is naturally very low carb and perfect for diets like Keto! It makes a great appetizer or snack for low carb diets. Make sure that your chosen items you are serving it with are also low carb. I really hope that you enjoy this much as my friends and I do! It has become a staple on our party table, especially when it comes to girls night! This quick and easy Cold Spinach Feta Dip is packed with flavor and a great appetizer for a party. You can serve it with veggies, chips, crackers, or pretzels. Thaw the spinach and wring as much of the water from it as possible. In a large bowl, combine the cream cheese with the garlic powder, salt, pepper, nutmeg, and cayenne pepper and mix until combined. Stir in the feta cheese, then mix in the spinach. Chill for 1 hour minimum, or until you are ready to serve. Enjoy! This also makes a great spread for sandwiches! This recipe is naturally gluten free and low carb. Please check the items you serve it with to make sure they comply with your desired diet. Nutrition facts provided based on my best estimation for the recipe and may not be accurate depending on what brands you use or modifications you make to the recipe. The facts here are calculated on the dip only and do not include anything it is served with. I recommend using a nutrition calculator with the exact brands and measurements you use for the most accurate calculation. This is hands down my favorite dip to make when I need something fast and easy for guests. Thank you! Absolutely delicious! I think I’m going to make this my new go-to recipe to bring to parties. I purchased chopped spinach but unfortunately it was a bit stringy as was suggested against so I’m going to have shop around for the right brand. Also, I used a few tbs of milk to soften it up but after chilling, it was still too solid for my preference. I think I’m going to add more milk and let it soften more before serving. So good! !